These Cities Aren’t Waiting for Trump to Self-Destruct. They’re Fighting Back Now. Dispatches from the Urban Resistance, from Los Angeles to El Paso. russia. comey. leaks. lies. collusion. Reading the obsessive reports constantly spewing forth from the nation’s capital, you might be tempted to think that the Trump administration’s blundering and babbling are all that matters—that the tales of palace intrigue and possible criminality are all the news that’s fit to print. And, to be fair, the tales are engrossing, like a sweet and steady delicious morphine drip that brings relief to an excruciating situation. As the leaks pile up, the pain dissipates in a haze of schadenfreude. Perhaps we don’t have to fight this regime so relentlessly after all. Perhaps it will simply self-destruct. Thankfully, millions of Americans aren’t giving in to Russiagate-induced complacency—and they aren’t leaving anything to chance. As Trump tweets and rages, as his administration teeters but doesn’t fall, they are building movements and getting creative, finding new ways to challenge injustice and inequality. They are winning elections, fighting plutocracy, and pushing back against the dictates of right-wing governors. They are, in short, working hard to make this country a kinder, better place—Donald Trump be damned. Donald Trump be damned, indeed! That’s the message the Los Angeles City Council sent in early May when it passed a resolution calling on Congress to investigate whether the president has committed crimes or misdemeanors that could lead to impeachment. The resolution, which passed on a 10-0 vote, makes Los Angeles one of the latest cities to urge an investigation into Trump’s docket of potentially impeachable offenses. Other municipalities, including Richmond, Berkeley, and Alameda, California as well as Cambridge, Amherst, and Brookline, Massachusetts, have passed similar resolutions in recent months. It’s no accident that cities are making pro-impeachment pronouncements. For months, activists aligned with a group called Impeach Trump Now have been quietly pushing their local elected officials to pass such resolutions. In the case of Los Angeles, an Impeach Trump Now affiliate called West Valley Resistance brought the idea to City Council member Bob Blumenfield, who co-authored Los Angeles’s resolution. Similar organizing is happening all over the country, says John Bonifaz, a Massachusetts-based attorney and one of the leaders of Impeach Trump Now. The dream goes something like this: If enough cities call for Trump’s head, driving up pressure on elected officials, then perhaps Congress will be forced to take action. Even before Trump and his coterie of kleptocrats arrived in DC, much of the work of fighting inequality fell to cities. Now, as Team Trump crafts a budget for the 1 percent, gutting social programs while slashing taxes for the rich, the fight for financial fairness falls even more heavily on local governments. Thankfully, they are rising to the occasion. On May 1, in Seattle, the City Council passed a resolution declaring its intent to pass a progressive income tax on high-earning residents by July of this year. An alliance of labor unions and grassroots groups called the Trump-Proof Seattle Coalition is spearheading the effort. Fearing that the Trump administration’s war on sanctuary cities will result in the loss of federal funding for Seattle, the group has called for a 1.5 percent tax on households with gross incomes greater than $250,000 a year. Such a tax would generate roughly $125 million a year for city coffers. Any such tax proposal, however, will likely face a serious court challenge, since state law prohibits counties and cities in Washington from taxing net income. In a blog post, Councilmember Lisa Herbold, who sponsored the resolution, wrote that the city would move forward with its plans despite the possible legal hurdles. On May 17, meanwhile, a San Francisco Board of Supervisors task force put forward a series of groundbreaking recommendations that would completely change the way the city collects fines and fees from its residents. In an attempt to combat rising inequality and indebtedness in the city, the task force called for a progressive fine and fee structure that charges people according to their ability to pay. Instead of charging a flat fine for, say, traffic violations, the city would instead implement a sliding scale system in which those with higher-incomes pay more and those with lower incomes pay less or perform community service. It’s the first proposal of its kind in the United States. To round out the economic news, New York this month became the latest—and largest—city to pass fair workweek legislation for fast food and retail workers laboring within its borders. Under a bill passed by the City Council on May 24—and signed by Mayor Bill de Blasio on May 30—brand-name fast food restaurants like McDonald’s will no longer be able to subject their workers to unpredictable and constantly-shifting schedules. Instead, they will be required to give employees their work schedules two weeks in advance, with financial penalties for any last-minute changes. The bill also requires employers to offer additional hours to part-time employees before hiring new staff. The bill is the latest victory for the Fair Workweek Initiative, a nationwide effort to end manipulative scheduling practices at corporate chains. San Francisco, Seattle and Emeryville, California have passed similar measures in recent years. When Texas Governor Greg Abbott signed a nasty bill in early May that effectively bans sanctuary cities in the state and establishes civil and criminal penalties for local officials who do not cooperate with federal immigration agents, he probably didn’t expect push back from the tiny border city of El Cenizo. But he got it anyway. 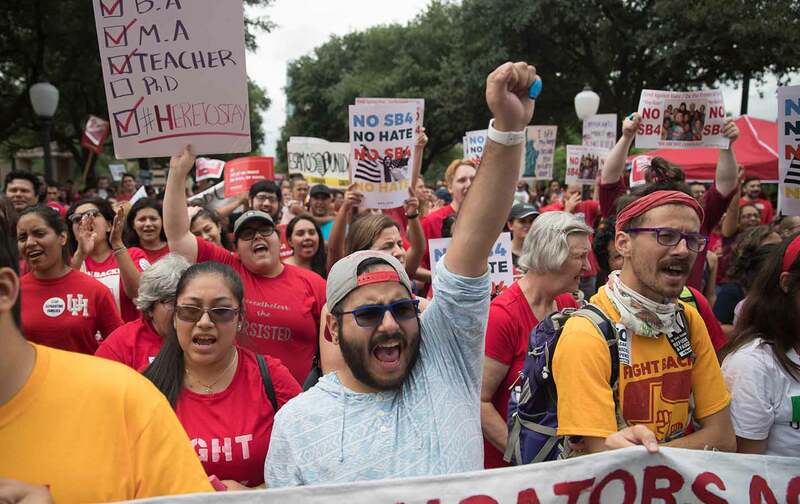 On May 8, the city government in that town of 3,300 filed a lawsuit in a San Antonio federal court arguing that Texas’s Senate Bill 4 (SB 4) violates both the state and the nation’s constitutions. The city, which has a large undocumented population, was joined in its lawsuit by nearby Maverick County as well as the League of United Latin American Citizens and the ACLU. On May 22, the county of El Paso filed its own lawsuit in federal court challenging the constitutionality of Abbott’s sanctuary-city prohibition. The city of Austin has also announced its intention to challenge the state’s brutal anti-immigrant policies in court. Bottom line: Cities are taking Governor Greg Abbott, pandering ideologue and gleeful bully, to court. For at least two years, a group called Take Em Down Nola has pushed for the removal of Confederate monuments and other symbols of white supremacy and racial oppression in the city of New Orleans. The group has staged protests, attended city hearings, organized marches, and burned Confederate flags in public venues. It has been dogged in its drive to shatter the images and erase the names of those who fought to preserve slavery and erect the system of racial apartheid that still lingers in this country today. This month, the group garnered a massive victory when New Orleans tore down four of its most infamous Confederate monuments. On May 20, after a 60-foot statue of Robert E. Lee had finally been removed from the city’s Lee Circle, Mayor Mitch Landrieu gave a speech in which he recognized the statue’s demise as a powerful blow against the memory and present reality of racist terror. They are also just the first step, activists insist. Take Em Down Nola wants to see all emblems of white supremacy removed, including street signs, school names, and a host of remaining monuments to slaveholders, Confederates, and brutalizers. And their struggle is spreading. In Baltimore, Mayor Catherine Pugh has announced that she would like to explore the possibility of “following in the footsteps of New Orleans” by removing some of the city’s most flagrant Confederate monuments. May saw two proud progressives take big strides toward power in very different cities. Chokwe Antar Lumumba, a radical 34-yeard-old attorney and black-liberation activist aligned with the Malcolm X Grassroots Movement, won 55 percent of the vote in Jackson, Mississippi’s May 2 Democratic mayoral primary. Lumumba, whose platform includes proposals to create a citizens’ police-oversight board as well as funnel more city contracts to local minority-owned businesses, is expected to win the general election on June 6 and become Jackson’s next mayor. He is the son of Chokwe Lumumba, the legendary radical activist, who was himself mayor of Jackson until his sudden death in 2014. Far to the north in Philadelphia, another progressive attorney, the civil-rights and criminal-defense lawyer Larry Krasner, won a hotly contested May 16 primary to be the city’s district attorney. If he wins the general election next November, Krasner has vowed to use the normally punitive office to protect Philadelphia’s sanctuary city status, effectively abolish the death penalty, and end the broken cash-bail system for nonviolent offenders, among other reforms. Oh, and happy belated May Day to all the marchers out there! For those of you who couldn’t make it, just know this: In cities across the country, from sea to shining sea, people hit the streets for roaring rallies that, once again, made Trump’s inauguration look like a feebly attended funeral. If you have tales of courageous organizing, inspired troublemaking, and strategic movement building that you’d like to share for next month’s edition, please e-mail us at cities@thenation.com.